Timeless engagement styles are celebrated and reimagined with a new sense of refined elegance in the New Classic Collection. A tapered, sparkling band leads up to an elongated halo featuring graduated round brilliant diamonds that highlight a brilliant center stone. Diamond Info: 28-RD 0.65 CTS Fits center stone size OV: 7x6, RD: 6.5 GUIDE Center stone not included. An elegant classic gets updated with a brilliant oval center set between two shimmering round side stones and a row of sparkly white diamonds. Diamond Info: 16-RD 0.20 CTS, 02-RD 0.19 CTS Fits center stone size OV: 7X5x4.5 GUIDE Center stone not included. An oval brilliant center is accented with vertically set graduated diamonds on either side as well as halfway along the shank for an updated effect on a timeless piece. Inverted pear-shaped and round brilliant cut diamonds perfectly highlight a center stone sitting flushed in a six prong head. Diamond Info: 22-RD 0.16 CTS Fits center stone size OV: 7X5 GUIDE Center stone not included. Inverted pear shaped and round brilliant cut diamonds perfectly highlight a center stone sitting flushed in a six prong head. Diamond Info: 02-RD 0.411 CTS, 02-PD 0.21 CTS Fits center stone size RD: 6.0-7.0 MM GUIDE Center stone not included. An elegant milgrain etched band of gleaming high polished gold tapers towards a trio of brilliant stones in this design from the New Classic Bridal Collection. Diamond Info: 02-RD 0.38 CTS Fits center stone size RD: 5.5 - 6.0 MM GUIDE Center stone not included. An elegant milgrain etched band of gleaming high polished gold tapers towards a brilliant center stone set in a 6 prong crown accented by diamond set pears, in this design from the New Classic Bridal Collection. Diamond Info: 04-RD 0.05 CTS Fits center stone size RD: 6.0 - 6.5 MM GUIDE Center stone not included. The LYRIA Signature Crown atop a gleaming band of sparkling white diamonds set in 18K gold adds a touch of femininity to a classic and timeless design. Diamond Info: 20-RD 0.21 CTS Fits center stone size RD: 6.0-7.0 MM GUIDE Center stone not included. Tapered diamonds climb and split towards a brilliant center stone set in the LYRIA SIGNATURE CROWN in this timeless design from the New Classic Bridal collection. Diamond Info: 18-RD 0.29 CTS Fits center stone size RD: 6.0-7.0 MM GUIDE Center stone not included. Stunning from every angle, brilliant diamonds surround a cushion center diamond in this classic setting. Diamond Info: 54-RD 0.50 CTS Fits center stone size RD: 7.0-7.5 MM GUIDE Center stone not included. Tapered diamonds climb and split towards a brilliant center stone set in the LYRIA SIGNATURE CROWN in this timeless design from the New Classic Bridal collection. Diamond Info: 22-RD 0.45 CTS Fits center stone size RD: 6.0-7.0 MM GUIDE Center stone not included. A split diamond band of gleaming diamonds lead to a stunning brilliant round center in this classic setting from the New Classic bridal collection. Diamond Info: 44-RD 0.30 CTS Fits center stone size RD: 8.0 MM GUIDE Center stone not included. 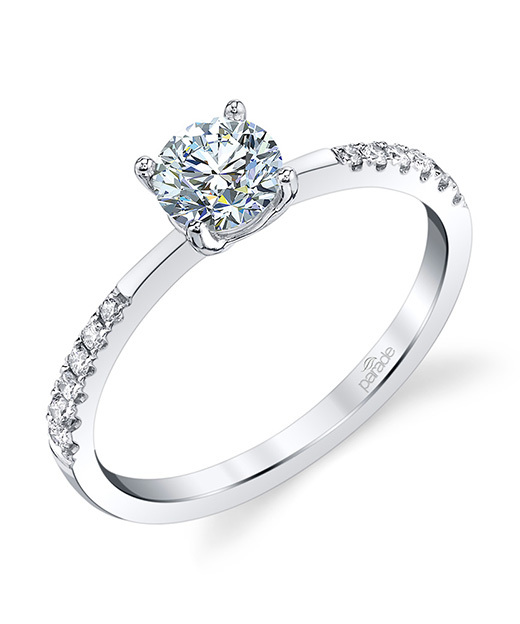 A split diamond shank leads to a brilliant round center set in the Lyria signature crown in this timeless classic. Diamond Info: 22-RD 0.26 CTS Fits center stone size RD: 6.0-7.0 MM GUIDE Center stone not included. A shimmering band of diamonds (0.28 ct) and 18K gold showcase a brilliant center stone in this classic engagement style. Diamond Info: 12-RD 0.28 CTS Fits center stone size RD: 8.0 MM GUIDE Center stone not included. An elegant milgrain etched band of 0.42cts of diamonds graduates toward a sparkling center stone set in 18K gold. Diamond Info: 18-RD 0.42 CTS Fits center stone size RD: 9.0-9.5 MM GUIDE Center stone not included. Parade's classic cushion halo engagement ring with a touch of glowing 18K rose gold. Diamond Info: 38-RD 0.30 CTS Fits center stone size RD: 6.0-6.5 MM GUIDE Center stone not included.